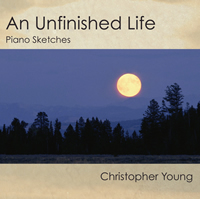 BUYSOUNDTRAX Records presents AN UNFINISHED LIFE – PIANO SKETCHES, featuring music composed by Christopher Young, featuring solo piano performances by Dave Guili. The album features music composed for demonstration purposes by Christopher Young for the 2005 drama directed by Lasse Hallstrom, adapted from the novel by Mark Spragg, starring Robert Redford, Morgan Freeman and Jennifer Lopez. The film was completed in 2003 but did not get released until 2005 and the composer found that much of his music for the film had been replaced by someone else. A previous release from Varese Sarabande presented a portion of this music as a bonus but, wishing to preserve all of the musical ideas he came up with for the film, the composer has reworked and expanded this thematic material into three extended suites for this album. AN UNFINISHED LIFE tells the story of the Gilkyson family, torn by tragedy, that learns the true meaning of forgiveness. Still in shock from his only son’s death a decade before, a retired rancher, Einar (Redford) spends his days caring for his ranch hand and oldest friend, Mitch (Freeman), who has survived a tragic encounter with a Grizzly bear. Content to live out the rest of his days alone, Einar’s quiet life gets turned upside down when the person he blames for his son’s accident, his daughter-in-law, Jean (Lopez) comes to town with her daughter. Golden Globe-nominated composer Christopher Young has scored nearly 100 films, including films such as HELLRAISER, JENNIFER 8, MURDER IN THE FIRST, COPYCAT, SPECIES, THE HURRICANE, SWORDFISH, THE SHIPPING NEWS, THE HURRICANE, THE CORE, THE GRUDGE, THE EXORCISM OF EMILY ROSE, SPIDER-MAN 3 and, most recently, UNTRACEABLE. Born in Red Bank, New Jersey, Young graduated from Massachusetts Hampshire College with a BA in music and did post-graduate work at North Texas State University, studying big band writing and classical composition before moving to Los Angeles in 1980. While enrolled at UCLA, he studied with famed film composer David Raksin. In addition to his career as a film composer, he has also taught composition at UCLA. AN UNFINISHED LIFE – PIANO SKETCHES is a limited edition release of 1000 units. NOTE: All autographed copies are now sold out.